One of the most important steps towards living well with Parkinson's is to seek out opportunities to learn about the disease symptoms, treatments and coping techniques. 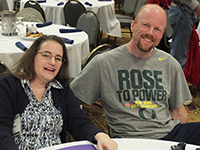 Parkinson's Resources of Oregon (PRO) offers many ways to improve your knowledge and understanding. Be sure to check our calendar to see when our next program will be! We have partnered with local neurology care providers to offer free presentations alternating locations around the region. These programs cover a variety of topics, focusing on the issues that are of greatest interest to people living with PD. This workshop is designed to provide family caregivers with information from professionals related to the care of advanced stage Parkinson’s disease. Participants will receive tools and resources for care management, future planning, and self-care. This program is offered several times a year throughout the region. Research confirms that people living with Parkinson’s disease live longer and have better quality of life when their care is supported by a team of health professionals with a deep understanding of the disease and treatments known to help with symptom management. These presentations featuring local and regional experts are designed to empower people living with Parkinson's to be informed healthcare consumers and self-advocates. PRO staff can be scheduled visit your community and provide a general informational session about Parkinson's, treatment options, and resources available. 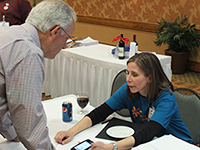 This program is a great way to help build awareness and visibility of Parkinson's disease. We have done this presentation for businesses, church groups, and long term care facilities. Educate. Inspire. Empower., the annual Parkinson’s disease education conferences are held during the spring months featuring leaders in the field of treatment and care as key presenters discussing a variety of topics of interest to people with PD, care partners, and professionals. Click here for a calendar of upcoming programs and events or call Parkinson's Resources to learn more about opportunities to enhance your knowledge and understanding of this complex disease! If you would like to receive regular program updates and announcements be sure to sign up for both the e-newsletter, and bi-monthly mail edition!